The blue imp character on the home page seems be a magnet for strong opinions, which range from "I hate it" and "At first I hated it, but now I've grown to like it", "I don't mind him" to "He's cute"
In this blog posting, I'll explain a bit of history and thinking behind the blue imp. I've also written a blog posting about how to remove the blue imp from your Magnatune experience, if you just don't like him. HISTORY: back in 2006 I launched BookMooch and hired cartoonist Andrice Arp to design the characters. I wanted something with some humanity, whimsy and a bit of edge to it. 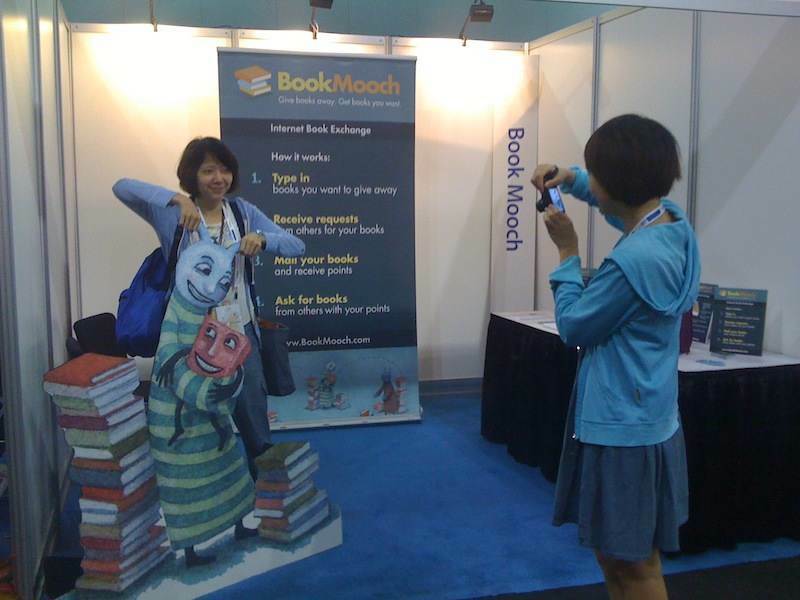 The illustration proved to be a big hit, and at conferences where we exhibit, we have big cutouts of the mooch characters, and people line up to have their photo taken next to them. Most music web sites are very visually techie, with photos of iPods and other devices dominating, like the top of mog's web site (pictured at right). There's no fun, humanity or emotion communicated. People especially liked the "happy pink bunny rabbit" (bottom right of MoodMixes) and he's become our mascot. But I replaced the cigar with a headphone cable. So... in a very real way, that blue imp is me, in crazy cartoon style, making a Churchill face at you! Do you still Remember those reallllly long lines outside the port-A-potty at the freak meets in the farmers field that no one actually bought tickets too - ? . . . or the smell once you got inside !(x)? From Jim Kin- AKA Shui Tao<(it means the way of water in Chinese) in Hong Kong China.